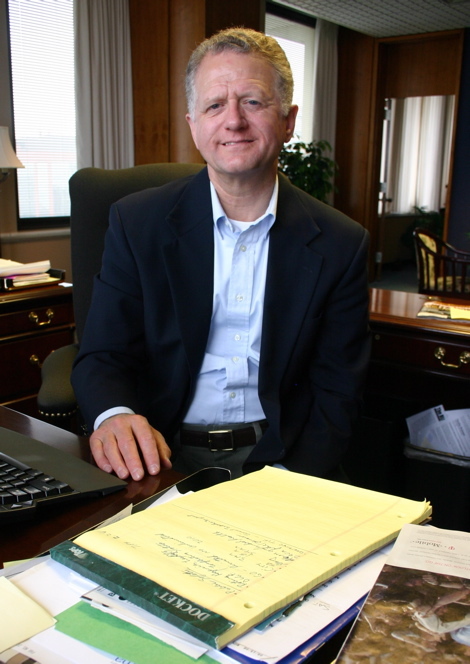 Fort Wayne mayor Graham Richard has made a name for himself by being a vocal proponent of local broadband Internet access, but when I sat down with him last week for an interview, I wanted to find out just how plugged in he really was. In fact, the only website Richard says he visits daily is the City of Fort Wayne’s -- not exactly a font of fresh information, unless you can’t wait to read the latest press release from the Office of the Mayor. The other sites Richard visits, he says, come from clicking on links in his email. “I have a lot of list-servs, transported directly to my email system, so the way I end up going online is basically I will take a link and, you know, I'll frequently link up,” he said. Richard’s wife, on the other hand, spends a good amount of time on the Internet. 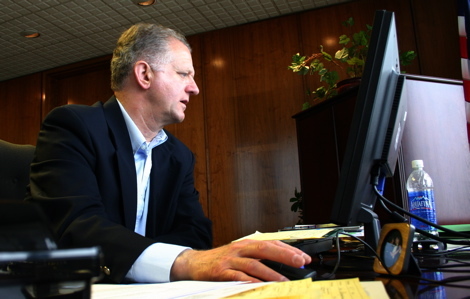 Richard has a PDA, two cell phones, and a bulky laptop that he totes around the country to give speeches and presentations, usually about Six Sigma or broadband in Fort Wayne. Richard readily admits he’s no tech-head. “I'm of that baby boom generation where it doesn't come as natural as it does to my son or my daughter, who have grown up with the use of web-based services and computers, so I have to do a little more learning and teaching,” he said. “I would say I'm a 'moderate' early adopter. I'm not the person to run out and get the latest thing." 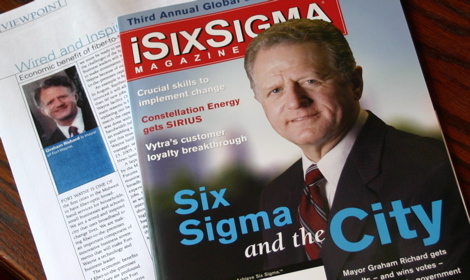 Richard had a packet of information he wanted to share with me, including a cover story in the Six Sigma Magazine and several articles he had written for broadband publications. He also just finished authoring a book on Six Sigma. Without even time to look at websites, I wondered how he finds the time to do all this writing. The process was a little different for his book. “The book that I'm getting ready to publish was a collaborative effort," said Richard, "and we just had a team of people that really went over all of the work that we had done with Lean and Six Sigma. We had a team of people for about 18 months [and] we'd get together about every other Friday." The book, as described by Richard, doesn't exactly sound like beach reading. Richard said he plans to make the book available online within the next thirty days. "We'll probably have it mounted on the website and it'll be a downloadable," he said. The mayor also discussed downtown. "Obviously we've been able to complete the downtown Grand Wayne Center [and] the Library. We're getting ready to add a hotel. We're looking at north of the river, where there could be a major family sports complex. We're looking at a downtown [baseball] stadium that could also have more housing and mixed use [facilities]." I asked him what he would say to a private business owner who wonders why he or she should invest in downtown when, through the City's use of eminent domain, they could end up having their property seized and used for another use, especially another private business like the hotel, as happened in the past with Belmont Liquors. "I would say that, number one, the tools that were available to us in state law were the tools that we used. Fortunately we didn't have to use it for the acquisition of all the property for the Grand Wayne expansion. At the time, we felt it was the prudent thing to do, to acquire that property," he said. "Since that time, the state law's been changed, and [that] probably could not happen again in the future." What about Richard's future? He said he hasn't decided whether he'll seek a third term as mayor. "That's a decision that I'll make and announce probably in the fall [as we] get a little closer to the '07 election," he said. "[Being mayor] has been an incredible opportunity for me. It was a dream of a lifetime," said Richard. "I've just been really blessed to have been given this opportunity to help our city at a time when I think we really needed to take a different direction and lift Fort Wayne and the community in a new direction, so I feel very good about where we are. We've got, I can probably tick off 20 projects that I'm critically concerned about and going to keep all my focus really on those." Richard said the recent annexation of the Aboite area, filled with lots of registered Republicans, wouldn't affect whether he'll seek a third term. "This decision will probably be more personal than political," he said. "Obviously I've never, ever had an easy race, being a Democrat in a very Republican community, so no race would ever be simple or easy." Richard says he'll make up his mind in October or November. "I think I'll look at all the factors and make a decision as to whether it's the right thing for me and my family and the community. I'd look at where we are with the goals that I wanted to try to accomplish. "It will be a difficult decision."